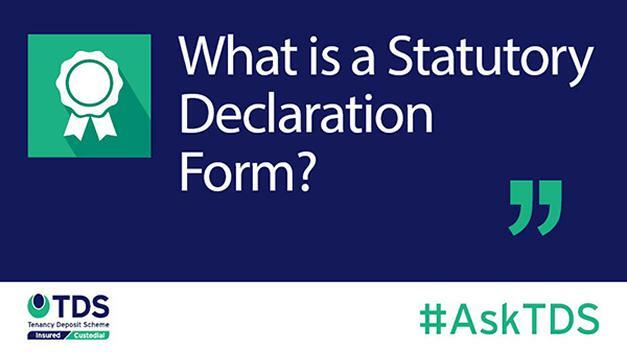 #AskTDS: What is a Statutory Declaration Form? In this week's #AskTDS, we answer a tenant's question; "What is a Statutory Declaration Form?" The world of renting can sometimes seem confusing, with jargon and technical terms often being used. We try to keep our communication with all parties involved in tenancies as clear and straightforward as possible, so that everyone can understand what their rights and responsibilities are in relation to tenancy deposits. With TDS Custodial, for us to release the deposit monies at the end of a tenancy, the parties to the tenancy must engage with us; whether that be where a resolution has been reached independently or if the parties require the use of the alternative dispute resolution service. The statutory declaration form is a legislative requirement and is required if one party requests for the deposit to be returned to them, but the other party does not respond to this request. If successful, payment of the deposit can be made to the requesting party without the other party having to respond. This is a legal document in which a statement is confirmed to be true. The document will need be witnessed and signed by a solicitor, Commissioner of Oath, Notary or Justice of the Peace in order to make it a statutory declaration. When one of the parties requests the deposit to be returned to them, the other party has up to 30 working days to agree or disagree to the request. If the party has not responded after the first 15 working days, we contact both parties via email to let them know that the responding party has not yet answered. At this point, the party who raised the repayment request is sent an empty template of the statutory declaration form to fill in and subsequently return to us. The document cannot be processed until after the deadline has surpassed for the response to the repayment request. Once received and accepted, we will send a copy of your completed application and exhibits to the other party and ask them to respond within 14 calendar days . If they do not respond, we will make payment according to the original repayment request. If they do respond, the statutory declaration form will no longer be applicable, and the case will move forward, becoming a potential dispute should the party not agree. If we reject the form, we will then post it back to you with the reasons why, and you will be required to send us a new form. How is the document completed? The party submitting the statutory declaration will firstly have to fill in their details (i.e. name, tenancy address, deposit amount, etc. ), and then state when the tenancy ended and how much of the deposit they wish to claim back according to the repayment request already raised. They can choose to state the last known contact details of the other party if they do not have a current address or any other means of contacting them. Alternatively, they can send us a copy of a written notice regarding the deposit repayment that had been sent to the other party. This will be known as Exhibit 1. Following this, they must confirm if they have had any contact/correspondence with the other party after the tenancy ended (the date being the same as stated in the repayment request). If they have had contact, it should be attached as Exhibit 2. However, please note that Exhibits are not compulsory for an application to be successful. Lastly, they will need a witness (solicitor, etc) to sign the form and declare the address where this was done. They will require the witness’s signature, and stamp if available. The signature fee (set in statute) should cost no more than £5.00, with a further £2.00 per exhibit included. You can find our handy guide on completing a Statutory Declaration form here. For further information on Statutory Declarations, or other enquiries around tenancy deposits, you can contact our excellent customer service team on the details listed here.